Ital. Cristoforo Colombo (krēstô`fōrō kōlôm`bō), Span. Cristóbal Colón (krēstō`bäl kōlōn`), 1451–1506, European explorer, b. Genoa, Italy. 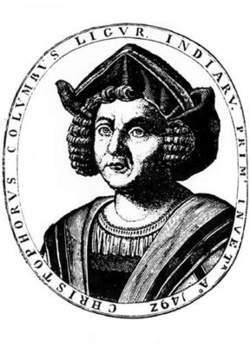 Columbus spent some of his early years at his father's trade of weaving and later became a sailor on the Mediterranean. Shipwrecked near the Portuguese coast in 1476, he made his way to Lisbon, where his younger brother, Bartholomew, an expert chart maker, lived. Columbus, too, became a chart maker for a brief time in that great maritime center during the golden era of Portuguese exploration. Engaged as a sugar buyer in the Portuguese islands off Africa (the Azores, Cape Verde, and Madeira) by a Genoese mercantile firm, he met pilots and navigators who believed in the existence of islands farther west. It was at this time that he made his last visit to his native city, but he always remained a Genoese, never becoming a naturalized citizen of any other country. Returning to Lisbon, he married (1479?) the well-born Dona Filipa Perestrello e Moniz. By the time he was 31 or 32, Columbus had become a master mariner in the Portuguese merchant service. It is thought by some that he was greatly influenced by his brother, Bartholomew, who may have accompanied Bartholomew Diaz on his voyage to the Cape of Good Hope, and by Martín Alonso Pinzón, the pilot who commanded the Pinta on the first voyage. Columbus was but one among many who believed one could reach land by sailing west. His uniqueness lay rather in the persistence of his dream and his determination to realize this "Enterprise of the Indies," as he called his plan. Seeking support for it, he was repeatedly rebuffed, first at the court of John II of Portugal and then at the court of Ferdinand and Isabella of Spain. Finally, after eight years of supplication by Columbus, the Spanish monarchs, having conquered Granada, decided to risk the enterprise. island of the Bahamas, West Indies. Many historians believe that it was the first land sighted by Columbus in the New World in 1492. The indigenous population called it Guanahani, and it has also been named Watling or Watlings Island. ..... Click the link for more information. ) in the Bahamas. He took possession for Spain and, with impressed natives aboard, discovered other islands in the neighborhood. On Oct. 27 he sighted Cuba and on Dec. 5 reached Hispaniola. Fitted out with a large fleet of 17 ships, with 1,500 colonists aboard, Columbus sailed from Cádiz in Oct., 1493. His landfall this time was made in the Lesser Antilles, and his new discoveries included the Leeward Islands and Puerto Rico. The admiral arrived at Hispaniola to find the first colony destroyed by the indigenous natives. He founded a new colony nearby, then sailed off in the summer of 1494 to explore the southern coast of Cuba. After discovering Jamaica he returned to Hispaniola and found the colonists, interested only in finding gold, completely disorderly; his attempts to enforce strict discipline led some to seize vessels and return to Spain to complain of his administration. Leaving his brother Bartholomew in charge at Hispaniola, Columbus also returned to Spain in 1496. ..... Click the link for more information. , had been in the New World and established much of the coast line of NE South America. It was 1502 before Columbus finally gathered together four ships for a fourth expedition, by which he hoped to reestablish his reputation. If he could sail past the islands and far enough west, he hoped he might still find lands answering to the description of Asia or Japan. He struck the coast of Honduras in Central America and coasted southward along an inhospitable shore, suffering terrible hardships, until he reached the Gulf of Darién. Attempting to return to Hispaniola, he was marooned on Jamaica. After his rescue, he was forced to abandon his hopes and return to Spain. Although his voyages were of great importance, Columbus died in relative neglect, having had to petition King Ferdinand in an attempt to secure his promised titles and wealth. , fl. 1002–15, Norse leader of an attempt to colonize North America. He appeared in Greenland in 1002 and married Gudrid, widow of one of the sons of Eric the Red. He set out c.
..... Click the link for more information. )—but his voyages mark the beginning of continuous European efforts to explore and colonize the Americas. Although historians for centuries disputed his skill as a navigator, it has been proved that with only dead reckoning Columbus was unsurpassed in charting and finding his way about unknown seas. See biographies by S. E. Morison (1942), E. D. S. Bradford (1973), H. Koning (1982), and F. Fernández-Armesto (1991); J. M. Cohen, comp., The Four Voyages of Christopher Columbus (1969); J. Axtell, Beyond 1492 (1992); W. D. and C. R. Philips, The Worlds of Christopher Columbus (1992); M. Dugard, The Last Voyage of Columbus (2005); L. Bergren, The Four Voyages (2011); D. Hunter, The Race to the New World (2011). Engraving of Christopher Columbus near the time of his famous “discovery” of the Americas voyage. Fortean Picture Library. Many have speculated about the background and religion of the "discoverer" of the New World. His childhood is shrouded in mystery and his motives full of language about "the glory of God." At times he seemed to be a Christian mystic. Later generations would laud him as God's instrument through which the "new" world was "opened" for Christianity. Still later ones would vilify him as bloodthirsty, greedy, and a poor navigator who failed to recognize where he'd landed. Investigations cast doubt as to his presumed Italian birth, and much evidence was forwarded to strengthen the belief that his parents were Marranos (secret Jews) who fled from Spain to Italy. It is known that his expedition was helped by Jewish scientists, financiers, and statesmen. Some historians believe that Queen Isabella did not actually pawn her jewels to finance the expedition, and that most of the funds came from the confiscated wealth of Spanish Jews, especially that of Luis de Santangel. A professing Jew, Abraham Zacuto, provided Columbus with scientific maps for the expedition, and a number of Marranos were members of his crew. It is recorded that the secret Jew, Luis de Torres, Columbus's interpreter, was the first white man who set foot on the soil of San Salvador, the first island of the New World to be discovered. Spain and Italy have long argued and fought over who gets to claim Columbus and his discoveries. Perhaps history will someday prove that Israel, for better or for worse, holds the honor. Whatever his biological ancestry, however, and whether or not his exploration was funded by Christians or Jews, there is no question that his discoveries soon denigrated into a battleground between competing Christian sects, secular authorities, and political parties. Christian friars marched beside Conquistadors to "Christianize" the Native Americans after their inevitable defeat. Protestants in New England sought to bring about the "New Jerusalem" by building a "city set on a hill" for all to see, while excluding the "Popish" folks whose church had established footholds to the south and west. It was, and still is, a confusing time for those whose political and national ties differ from their religious convictions. The United States Constitution eventually separated church and state by decree, but the laws of other countries did not. Sometimes political powers held sway only because the power of the church allowed them to. Other times saw different problems. All this points to the fact that Columbus sailed under competing, conflicting motives that prefigured what was to come. Official documents claim spiritual aims. He wanted to convert the "heathen" and spread the gospel. But, as always, political gain was everything. Riches, not only for the state but also for the explorer, figured heavily into the mix. (Italian, Cristoforo Colombo; Spanish, Cristóbal Colón). Born 1451 in Genoa; died May 20, 1506, in Valladolid. Navigator, of Genoese parentage. From 1476 to 1484, Columbus lived in Lisbon and on Portugal’s Madeira and Porto Santo islands. Relying on the classical theory of the earth’s sphericity and on incorrect calculations by 15th-century scientists, Columbus drew up a plan of a western sea route from Europe to India, which he believed would be shorter than existing routes. In 1485, after the Portuguese king rejected his plan, Columbus moved to Castile, where, with the support mainly of Andalusian merchants and bankers, he was able to get a government oceanic expedition organized under his command. The first expedition (1492–93), consisting of 90 men on the vessels Santa María, Pinta, and Niña, sailed from Palos on Aug. 3, 1492, turned west from the Canary Islands on September 9, crossed the Atlantic Ocean in the subtropical zone and reached the island of San Salvador in the Bahamian archipelago, where Columbus landed on Oct. 12, 1492 (the official date of the discovery of America). From October 14 to October 24, Columbus visited a number of other Bahamian islands, and from October 28 to December 5 he discovered and explored a section of the northeastern coast of Cuba. On December 6, Columbus reached the island of Hispaniola and moved along its northern shore. On the night of December 25 the flagship Santa María ran aground on a reef, but the crew was saved. Columbus completed the exploration of the northern shore of Hispaniola on the Niña from January 4 to January 16 and on Mar. 15, 1493, returned to Castile. The second expedition (1493–96), which Columbus headed with the rank of admiral and as viceroy of the newly discovered lands, consisted of 17 vessels with a crew of more than 1,500. On Nov. 3, 1493, Columbus discovered the islands of Dominica and Guadeloupe and, after turning northwest, about 20 islands of the Lesser Antilles, including Antigua and the Virgin Islands; on November 19 he discovered the island of Puerto Rico and approached the northern shore of Hispaniola. On Mar. 12, 1494, Columbus, in search of gold, began a conquest of the interior and crossed the Cordillera Central, returning on March 29. From April 29 to May 3, Columbus, with three vessels, moved along the southeastern shore of Cuba, turned south from Cabo Cruz, and on May 5 discovered the island of Jamaica. Returning on May 15 to Cabo Cruz, Columbus sailed along Cuba’s southern coast to 84° W long, and sighted the archipelago of Jardines de la Reina, the Península de Zapata, and the Isla de Pinos. On June 24, Columbus turned east and between August 19 and September 15 explored the entire southern shore of Hispaniola. In 1495, Columbus continued the conquest of Hispaniola; on Mar. 10, 1496, he left the island and on June 11 arrived back at Castile. The third expedition (1498–1500) consisted of six vessels, three of which Columbus himself conducted across the Atlantic Ocean near 10° N lat. On July 31, 1498, he discovered the island of Trinidad, entered the Gulf of Paria from the south, and sighted Paria Peninsula and the delta of the Orinoco River and the mouth of its western arm. This marked the discovery of South America. Sailing on into the Caribbean Sea, Columbus approached the Punta de Araya, discovered the Isla de Margarita on August 15, and arrived in the city of Santo Domingo (on Hispaniola) on August 31. In 1500 he was denounced, arrested, and sent to Castile, where he was freed. The fourth expedition (1502–04) set out after Columbus secured permission to continue the search for a western route to India. With four vessels he reached the island of Martinique on June 15, 1502, and the Gulf of Honduras on July 30. Between August 1, 1502, and May 1, 1503, he explored the Caribbean shores of Honduras, Nicaragua, Costa Rica, and Panama to the Gulf of Urabá. After Columbus then turned north, his vessels were wrecked at Jamaica on June 25, 1503; help from Santo Domingo came only a year later. Columbus returned to Castile on Nov. 7, 1504. Columbus’ discoveries were accompanied by colonization of the islands, the founding of Spanish settlements, and the enslavement and extermination of the indigenous population, whom he called Indians. Columbus’ priority in the discovery of America has been debated in scholarly literature. It has been established that Vikings visited islands and coastal areas of northern and northeastern North America hundreds of years before Columbus; it has not been ruled out that Europeans and inhabitants of Africa accidentally reached the shores of tropical America. However, only Columbus’ discoveries were of worldwide significance, since it was only after his voyages that the American lands became part of geographic concepts. Columbus’ discoveries contributed to a revision of the medieval world view and to the appearance of colonial empires. Magidovich, I. P. Istoriia otkrytiia i issledovaniia Tsentral’noi i Iuzhnoi Ameriki. Moscow, 1965. Ballesteros y Beretta, A. Cristóbal Colón y el descubrimiento de América, vols. 1–2. Barcelona-Buenos Aires, 1945.